Politics is generally the very last subject that is talked about at Cannes. So I was surprised to find that two political campaigns left Cannes with trophies to put on their mantelpieces. Barrack Obama’s presidential campaign picked up two awards for its combination of new media, door-to-door and grass roots campaigning along with highly tactical use of traditional TV advertising. The campaign picked up a Titanium and an Integrated Lions award. The first goes to campaigns that are “provocative, challenges assumptions and points to a new direction”. The second goes to campaigns that are, well, integrated. A campaign to boost sales of The Zimbabwean, the newspaper that attacked Robert Mugabe’s regime by using the troubled country’s almost worthless bank notes to make billboard adverts, was awarded a Gold Lion in the Titanium and Integrated Lions category. Created by the South African agency TBWA/Hunt/Lascaris Johannesburg, it also won the grand prix for outdoor advertising. 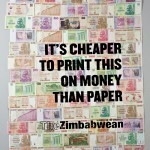 It ran slogans such as “It’s cheaper to print this on money than on paper” (a reference to the country’s chronically devalued currency).